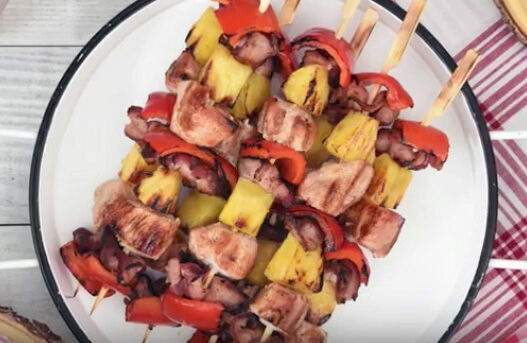 With summer picnic season finally in full gear, it’s time to give a shout out to one of my all-time favourite warm weather foods: grilled turkey kabobs! Turkey kabobs are easy to make, fast to cook, nutritious and delicious! Here are my top seven reasons to try turkey kabobs this summer! Finger food at its finest. Loaded with turkey and veggies, kabobs are perfect for picnicking: they are like a meal-on-a-stick, with no forks required! Tasty Tip: Cook kabobs ahead of time, pack them in your cooler and enjoy them cold. Or bring along your portable barbeque or hibachi and cook them right at your picnic spot. Powerful nutrition punch! Turkey and veggies each offer their own unique nutrient package and together on a kabob, they combine to boost the good-for-you value of your picnic. The iron and zinc in protein-rich turkey helps you better absorb these same nutrients in veggies. That’s what I call a dynamic duo! Say goodbye to flare ups. White or dark meat, turkey is lean and so you’ll have fewer flare ups on the barbeque. That’s especially good when you’re cooking for a crowd and might get a little distracted by outdoor fun! Kabobs save time. When you make kabobs with pieces of turkey, they cook quickly, which is a big time saver. Tasty Tip: Cut all pieces of turkey meat the same size (not too small) so they cook evenly. Make turkey kabobs ahead of time, marinade and keep them in the fridge overnight. They’ll be ready to grill for a quick weeknight picnic dinner. Budget-friendly. Kabobs are an especially economical way to enjoy turkey. A little turkey, mingled with veggies on a skewer, goes a long way! Love those leftovers. Be sure to make extra turkey kabobs – leftovers are super for snacking or packing in lunches. Eat them right off the skewer or chop and add to leafy green salads, sandwiches or grain-based salads! Versatility plus! You can kabob turkey thigh, turkey breast or even turkey sausages. Since turkey pairs perfectly with all sorts of veggies, you can create an endless variety of kabob combos. Tasty tip: Cut veggies and fruit about the same size as the turkey pieces. My favourite veggies to skewer with turkey are red pepper, onion, mushrooms, and zucchini. My go-to fruits are pineapple, peaches and mango. Like Italian? You’ll love these Pesto & Sun-Dried Tomato Turkey Kabobs made with turkey breast. If you like a little heat, this Jerk BBQ Turkey Kabob with Mango Salsa, featuring turkey thighs, is for you! Aloha! These Hawaiian Kabobs using fresh turkey sausages and pineapple will remind you of a day at the beach! Try turkey for your kabobs. Ask your butcher or grocer about available cuts.